Many Americans find themselves in financial stress and the decision to declare bankruptcy can be difficult. 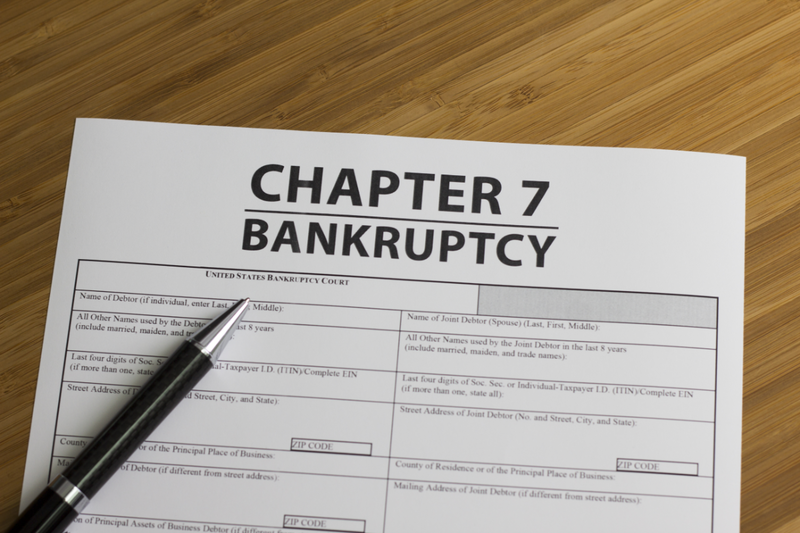 Chapter 7 bankruptcy allows you to wipe out debts and get a fresh start financially. The trustee assigned to your case will collect your assets and sell all of those that are not exempt. The proceeds from the liquidation are then distributed to your creditors. You receive a fresh financial start. After the bankruptcy is discharged, the only debts you will owe are for secured assets such as child support, alimony, student loans, and taxes. When you file, you will have immediate protection against collection efforts and wage garnishment. Wages that you earn and property that you acquire after the bankruptcy are yours, not the creditors or the courts. There is no minimum amount of debt required for Chapter 7 bankruptcy. Chapter 7 bankruptcy cases are over and completely discharged in roughly 3 to 6 months. You may be able to obtain new lines of credit within one to three years of filing bankruptcy. You may lose your non-exempt property which is sold by the trustee. If you want to keep a secured asset and it is not completely covered by your Indiana bankruptcy exemptions, then Chapter 7 is not an option. If you are facing foreclosure on your home, the automatic stay created by filing bankruptcy is only a temporary solution against foreclosure. Co-signers of a loan can be stick with your debt unless they also filed for bankruptcy protection. If you filed a prior case and received a discharge of your debts, you may only file a second Chapter 7 bankruptcy case eight or more years after you filed the first case. You will lose all of you credit cards. Bankruptcy will ruin your credit for some time and can remain on your report for up to 10 years. When you make the decision to file Chapter 7 bankruptcy, you will likely feel overwhelmed by all of the information available to you. An experienced Indianapolis bankruptcy attorney can help you determine the best course for a healthy financial future. You will want to consider whether you can avoid bankruptcy or how to preserve valuable assets if a bankruptcy is absolutely necessary. Attorney Richard Batesky has been helping individuals gain a healthier financial future for nearly 30 years. Contact us for a complimentary consultation regarding bankruptcy and your financial stresses.